While all topics are welcome, the location of the conference in the U. S. capital invites readings related to nationalism, cosmopolitanism, transatlanticism, seats of power, Americana, museum cultures in the 19th C, material cultures, and the work of preservation. Further, given the centennial years of World War I, papers offering new examinations of Wharton’s relationship to the war are particularly invited. Proposals might also explore Wharton’s work in the context of such figures as Teddy Roosevelt and Henry Adams or Wharton’s work in relation to that of her contemporaries, such as Gertrude Stein, Willa Cather, F. Scott Fitzgerald, Ernest Hemingway, Nella Larsen, Anita Loos, Henry James, and more. All theoretical approaches are welcome, including feminist, psychoanalytic, historicist, Marxist, queer studies, affective studies, disability studies, and ecocritical perspectives. This entry was posted in CFP, Conferences on March 23, 2015 by Donna Campbell. My name is Adam Pasen and I am the playwright of Tea with Edie and Fitz, a new work about the notorious meeting between Edith Wharton and F. Scott Fitzgerald at her estate for tea. I am e-mailing because the play (in addition to winning the BroadwayWorld Award for best new work and having monologues from it included in Best Women’s Stage Monologues and Scenes 2014 from Smith & Kraus) was recently published in its entirety by Chicago Dramaworks. I was wondering if you will be willing mention this on the Edith Wharton Society page in the New Books and Edith Wharton in the News section and/or on the Twitter Feed. It would be an honor to be able to reach so many Wharton aficionados at once! I have included a link to the publication page below as well as a production still of Edith with Scott Fitzgerald from the show. Please let me know if you would be willing to share the play with the Society, it would mean so much to me! This entry was posted in Wharton in the News on March 20, 2015 by Donna Campbell. New Query: Date of unpublished “Fiction and Criticism”? Comment: Is there any speculation about the approximate date of Wharton’s unpublished “Fiction and Criticism,” reprinted in The Uncollected Writings (1997)? Even a decade (late 20s/early 30s)? Thanks so much! n the second paragraph of “Fiction and Criticism,” Wharton quotes an article titled “Notes of a Novel Reader” from Volume 36 of _The Critic_, published in 1900. The time markers in the first two paragraphs of Wharton’s piece (“Not many years ago” and “A few years since”) suggest that the piece in _The Critic_ was fairly contemporaneous with Wharton’s critique of it. Based on these clues, it seems reasonable to suggest that Wharton wrote “Fiction and Criticism” within a few years of 1900—and probably no later than 1910. This entry was posted in Queries on March 19, 2015 by Donna Campbell. As some of you know, the Edith Wharton Society is currently organizing a conference to be held in Washington, DC early June 2016. A formal call for papers and conference web site will soon follow. At this time, Conference Directors Melanie Dawson and Jennifer Haytock, with the help of EWS Treasurer Carole Shaffer-Koros, are seeking incorporation as well as tax-exemption in Washington, DC for purposes of hosting the conference. Doing so will make a marked difference as the Society is currently operating on a very limited budget. This means, then, that we are hoping to identify a contact person with a Washington, DC address. It is important to note that whoever volunteers will incur no responsibility whatsoever; Carole Shaffer-Koros will be handling this process. Of course the Society will owe this person a great debt of gratitude. If you or someone you know is willing, please contact me directly, as soon as possible, at the address below. All best wishes and thank you for your time and consideration. This entry was posted in Announcements on March 19, 2015 by Donna Campbell. 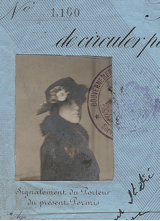 The Beinecke Library has acquired several issues of World War I-era Red Cross newsletters Hyeres Weekly News and Hyeres and There containing previously unrecorded writings by Edith Wharton. The newsletters are available online here: Hyeres Weekly News: http://brbl-dl.library.yale.edu/vufind/Record/3999462; Hyeres and There: http://brbl-dl.library.yale.edu/vufind/Record/3999463. The newsletters accompany a scrapbook compiled by Harriet B. Sanders, who served with the American Red Cross Southern Zone staff in Hyères, France, from September 1918 to May 1919 (YCAL MSS 995). This entry was posted in Announcements, Wharton in the News on March 17, 2015 by Donna Campbell. New Query: Wharton to Berenson? Could any one please confirm that these lines come from a letter Wharton sent to Berenson? And where could I have the source of the quote? This entry was posted in Queries on March 7, 2015 by Donna Campbell.